If you are looking for a good location to start a small business today, consider getting a business for sale Bass Coast. One major advantage of getting a franchise is that you will only need to follow a highly structured business system and you’re all set to gain profit. 1. It’s a strategic location. Bass Coast Shire is home to lots of stunning tourist destinations where locals and foreigners flock. Since it is a town that easily attracts a crowd, it is the perfect place to start a business. One good Bass Coast franchise opportunity is a claw machine franchise, where you can own and operate claw machines and collect profit from them. 2. You get to operate exclusively. With this Bass Coast franchise opportunity, you are given the freedom to set up your claw machines within the town exclusively—meaning you are free from competition with the same franchise. 3. You get full support from the franchisor. 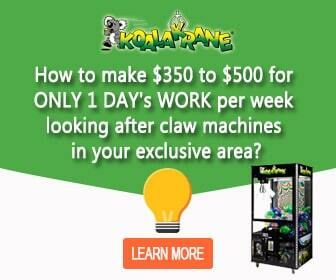 As a member of the Koalakrane franchise, you will be fully assisted along the way. Transitioning into this kind of business will be a breeze since you will be provided with seminars and training that will help you reach success. If you are interested on becoming a Bass Coast franchisee, reach to us so we can further assist you and advise for other available towns. We receive a lot of enquiries each day so call us now before someone else grabs this opportunity!